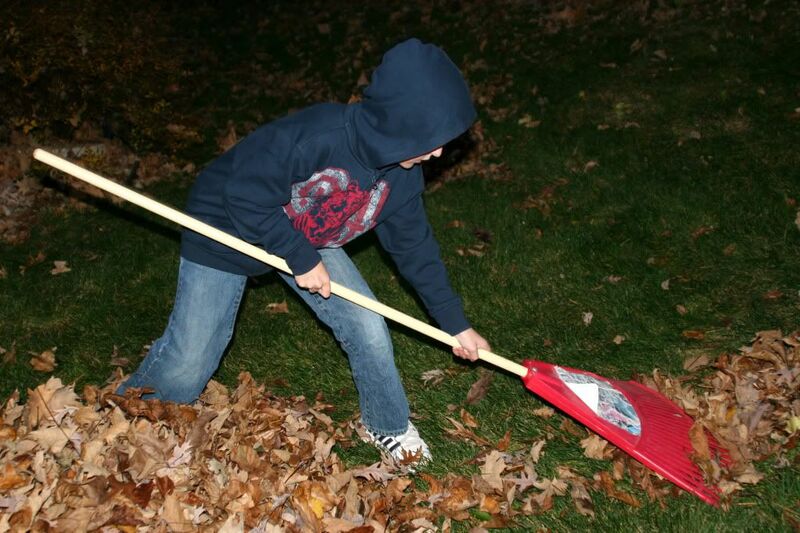 Little Man has been working night and day to get the raking done before Daddy gets home. When Pokey found out he was doing it for a monetary incentive she wanted to help too. Hopefully Haldan will compensate them both fairly. I'm going to leave that one up to him, but it's nice to see them work hard together for a common goal. I forgot to mention yesterday that I'm also having TMJ issues again... the curse of my life. My left side has been swollen and slightly off-kilter and today's dentist appointment was the last thing it needed. The good news is no cavities and no outbursts from the children in the waiting room. The bad news is that the 45 minutes with my mouth open seems to have put my jaw into further trauma and now the pain is all along my jaw line and down my neck. I think it's due to clenching or grinding at night, but it's obviously subconscious and hard to prevent. They've discussed a mouth guard the last couple visits, but a little pricey and no guarantees that it will help. I got another phone call from our realtor in UT today and not great news regarding the short sale. The initial prospective buyers have backed out and now we are back to square one. It looks like it could be another 6 months and I think it will be impossible to come up with the mortgage for that duration. I try not to think about it as much as possible, but I'm sure that could be a contributing factor with the subconscious clenching. We do have another offer on the table, but it could take 90-120 days with the bank and then another 45 days for them to close after that. That's if they don't back out. The good news is that they have agreed to move into the house on a month by month basis, but are only willing to pay us $500 rent. They will pay utilities though, which will be good through the winter months. Please pray that it will move quickly. I received a not so welcome present from Haldan today. We woke up to the most horrible stench. When Pokey opened the fridge we knew it was coming from there. Turns out that Haldan must have taken out some chicken to thaw a couple weeks ago and forgotten it. It was in a container under the meat drawer. I knew I couldn't leave it in the house all day and I also didn't want to leave it in the garage, so... I double bagged it, container and all, and off loaded it in a ghetto gas station dumpster on the way to work. Problem solved. The smell was much better when we got home tonight. Good picture. I'm glad he will work willingly to earn money. 2nd: here's the answer to my question from post before on your TMJ. Grinding due to stress makes sense. I'm sure we all have our own stress-reliever devices we're not even aware of...which in your case, sorry it's a painful one!! 4th: hahaha Super thinking on the rotten meat front!